Tom Clancy's Ghost Recon Advanced Warfighter (GRAW) is a tactical shooter video game released for Xbox 360, Xbox, PlayStation 2 and Microsoft Windows. As in previous Ghost Recon games, players command their team of Ghosts while neutralizing hostile forces and completing various mission objectives. These objectives can range from escorting friendly units across the map to rescuing hostages or taking out enemy artillery. Being a tactical shooter, Tom Clancy's Ghost Recon Advanced Warfighter places emphasis on using cover effectively in order to stay alive, together with sound strategic co-ordination to successfully complete mission objectives. A new feature is the Integrated Warfighter System, a system based upon the Future Force Warrior program. Tom Clancy's Ghost Recon Advanced Warfighter 2, the game's direct sequel, was released a year later in 2007. On July 3, 2018, the Xbox 360 version was released for Xbox One Backwards Compatibility. Gameplay emphasis in Tom Clancy's Ghost Recon Advanced Warfighter is placed upon the player doing the bulk of the fighting in each mission, through the character of Captain Scott Mitchell, while relying on tactical combat rather than arcade run-and-gun shooting to overcome enemies. Combat in the game is more forgiving than in previous titles in the series, with players being able to survive several bullet hits before dying, instead of dying after only a couple of shots like in the original Tom Clancy's Ghost Recon series. However, players are unable to regain lost health in the middle of a mission, and a single headshot or a sustained burst of assault rifle fire can kill the player instantly. GRAW features numerous firearms, many based on real weapons, including the Heckler & Koch G36, the Beretta M9, and the FN SCAR. A few, such as the MR-C, are actually hypothetical prototypes. The game also makes use of various other pieces of equipment, including tanks, helicopters, armored personnel carriers, and remote-controlled unmanned aerial vehicles, which can be used tactically to overcome obstacles, and scout out the environment, in order to complete objectives. GRAW features three versions of the game that each have slight minor variations in storyline/missions that is found on a different game platform's version; the main storyline, though, remains the same between the versions. While both the PlayStation 2 and Xbox versions are essentially the same title, the Xbox 360 and the Windows versions each stand out on their own with their own unique features, including the ability to command a squad of soldiers indirectly. One unique feature of the gameplay is the cross-com system, which is designed to allow players indirect control over friendly units assisting them on a mission (e.g. helicopters, UAV drones, etc. ), by giving them commands on what to do, whether to locate enemies or deal with a particular threat encountered. This system can be used in conjunction with the game's Intel map - a tactical map showing the entire play area and location of objectives, enemies and friendlies/allies - to issue commands. Notably, this gameplay feature varies between the different versions. For the Xbox 360 version, the system highlights enemies spotted by both the player and both their squad and other allies, while the Microsoft Windows version only highlights enemies seen by the player's squad and not themselves. Both the PlayStation 2 and Xbox console versions of Tom Clancy's Ghost Recon Advanced Warfighter are played in first-person, but have notably fewer features than those found in the Xbox 360 or the Windows versions. The most notable differences to the other versions is that players only have a single AI-controlled teammate following them on missions (as opposed to a squad of 3 soldiers), there are more levels but of shorter lengths, and that Scott Mitchell (the main character of the story) never speaks throughout these versions. Unlike all other versions of GRAW, the Xbox 360 version gives players a choice between using either a third-person or first-person perspective during the campaign mode, and also features a unique covering system that allows the player to duck behind objects for protection from gun-fire while performing tactical maneuvers such as pop-and-shoot. In addition, some levels feature on-rail sections in which players must eliminate as many enemies as possible from their airborne transport via the use of a mounted gun, and if a mission provides them with a squad, they may issue orders only to the entire squad via the cross-com system and not to individual squad members. Players cannot recover ammo from fallen enemies but can take their weapons if needed, otherwise they must re-arm at either rally points or ammo stations. The Microsoft Windows version of Tom Clancy's Ghost Recon Advanced Warfighter is played from a first-person perspective. This version features larger levels than those of the console versions with enemy AI more likely to use ambush tactics, thus greater emphasises is placed upon using squad tactics and having more situational awareness in each mission in order to achieve success. The cross-com system in this version is more flexible, capable of issuing more controlled commands to individual squad members, as well as plotting out attack routes and battle plans for other friendly units. In addition, player's cannot take discarded weapons, unlike the other versions, but can take ammunition from the weapons of dead enemies or allies, if the player's weapon is of the same calibre. Unlike other versions, players may choose the weapons for their selected Ghost team before the start of a mission, although this is done with no briefing given, with each Ghost member being able to carry a primary weapon and a secondary weapon, while either carrying extra ammunition or a heat-seeking anti-tank weapon. Unlike other versions, every Ghost member has a maximum weight limit on how much they can carry, with them becoming fatigued from sprinting at a much faster rate, the more equipment they are carrying, while weapons may be modified with various attachments, such as optical sights, grenade launchers, silencers, and vertical foregrips. Every modification has used on a weapon has its advantages and disadvantages. For example, attaching a grenade launcher reduce accuracy and adds weight, but adds extra firepower including the ability to take out multiple targets with grenades, while adding a silencer reduces noise and muzzle flash of a weapon at the expense of accuracy and range. The Microsoft Windows version can take advantage of the presence of a PhysX card, however the enhancements are only cosmetic and do not affect gameplay. Online multiplayer on the Microsoft Windows edition has both versus and co-op mode. Versus mode features 32 players, which is double that of the Xbox 360 version. The online co-op mode only supports up to 4 players maximum on Windows (the Xbox 360 version supports up to 16 co-op players). For those with the Xbox 360 version, some new Xbox Live features are included. For the Xbox 360 version the co-operative campaign (which currently features 8 missions - 4 of which are now available on the Xbox Live Marketplace) and multiplayer maps are all set in Nicaragua as a follow-up to the Mexico City missions of the single player campaign. On June 22, Ubisoft released the Chapter 2 Downloadable Content for 1,200 Microsoft Points on the Xbox Live Marketplace. The price of 1,200 Points was later reduced to 600. In the UK, a special Game of the Year edition was released in late 2006 containing a card enabling the player to obtain (for free) all the marketplace content, including the Chapter 2 download. The game is also budget priced. The PlayStation 2 and Xbox versions have some similar online game modes and can be played with up to 8 players. The story, written by Gérard Lehiany, unfolds entirely across a realistic and detailed modelling of Mexico City, one of the world's largest cities. The events take place in 2013 and over a period of three days, and each mission's environment ranges from heavily industrialized areas to local parks and landmarks to office districts. Seeking to unify their countries' security and to combat the smuggling of drugs and weapons, and the movement of terrorists between their borders, the Canadian prime minister and U.S. President Ballantine travel to Mexico City for a summit with Mexican President Ruiz-Peña, to sign a historical treaty known as the North American Joint Security Agreement (NAJSA). At the same time, a team of the elite Ghost Recon force, led by Captain Scott Mitchell, is sent into the city to intercept a deal taking place and recover Guardrail IX, a U.S. device capable of disrupting wireless communications, which had been taken from a spy plane that was shot down in Nicaragua. However, complications arise when a coup d'état begins in Mexico City, forcing General Joshua Keating, the Ghost's primary commander, to abort the mission so that Mitchell can locate and extract both Ballantine and Ruiz-Peña, who both went into hiding shortly after Mexican rebels attacked the summit, killing the Canadian Prime Minister in the process. Although the Ghosts rescue both VIPs, rebel anti-air forces Ballantine to hold at the perimeter of the city's airport until it is neutralized, while an attempt by rebels to kill the Mexican president fails after he survives an explosion at the city's U.S. Embassy and a massive assault by them is thwarted by the Ghosts. During this time, news reports confirm that the coup is being spearheaded by a rebel special forces group called the Aguila 7, led by members opposed to NAJSA, including General Ontiveros, and his son Colonel Carlos Ontiveros, a former student of Bud, Mitchell's friend and a UH-60 pilot. Seeking to re-establish order, Ruiz-Peña allows U.S. forces to combat the rebellion, with Mitchell ordered by Major General Martin to help clear a path into the city, whereupon he neutralizes artillery and anti-air weapons, assaults Chapultepec Castle, and eventually secures some of the 50 M1A2 Abrams tanks given to the Mexican government as part of NAJSA signing, to help combat rebel armour. But during his efforts to secure the tanks, Aguila 7 ambush the troops guarding Ballantine and capture the U.S. President, forcing Mitchell to locate him in the city's shanty district and extract him once more. Although they rescue the U.S. President, Keating orders Mitchell and the Ghosts to find and recover the "Football", after the rebels steal it, but are thwarted by them through the use of Guardrail IX, which Lieutenant Barnes, the intelligence officer assigned to the Ghosts, quickly reveals is being used to monitor and disrupt communications between U.S. forces. Mitchell quickly manages to find and destroy most of the device, before assisting allied forces in pushing for Zocalo Plaza, rescuing Martin when his Black Hawk is downed. During this time, Keating informs Ballantine that the rebels are still using elements of Guardrail IX to hack into NORAD, in order to gain control over the United States' ICBMs and buy time to gain international support for their coup, which in turn causes China and Russia to ready their own and thus escalating the crisis in Mexico. Mitchell quickly is ordered to assist in the final push for Palacio Nacional, destroying the last parts of Guardrail IX, and eventually helping to capture General Ontiveros before he can flee, but is unable to find the "Football" with him. Mitchell quickly learns that Carlos has the "Football", after he manages to escape and hijacks Bud's Black Hawk, killing Bud in the process. Forced to fight to the wrecked U.S. embassy where Carlos begins to transfer the codes for the U.S. nuclear arsenal, Mitchell and his team overcome the last remnants of Aguila 7, successfully killing Carlos and recovering the "Football", ending the crisis. As the group leave the city for the States, earlier talk about a traitor in the U.S. government is confirmed by Barnes, who reveals through news footage that a retired U.S. Army general, who was in opposition to NAJSA, turned traitor by assisting Ontiveros and Aguila 7 in their activities, explaining how Guardrail IX fell into their hands and how they were able to hack into NORAD. In May 2005, the Xbox 360 edition of Advanced Warfighter was shown to the press in trailer form at the E3 (Electronic Entertainment Expo) convention in Los Angeles. The Xbox 360 version of Ghost Recon: Advanced Warfighter was released on March 9, 2006 to multiple rave reviews. GameRankings and Metacritic gave it a score of 90.47% and 90 out of 100. Electronic Gaming Monthly praised the game's stunning next-generation presentation and high entertainment value, giving it an average score of 9.5 out of 10. The game was noted for its deeply immersive atmosphere, smart A.I. (though flawed for the squad and VIP A.I. ), wide variety of weapons, multiple action scenes and believable storyline. The Xbox 360's version was particularly noted for its realistic graphics. GameTrailers gave the game its highest review ever, a 9.9 out of 10, stating that GRAW is a landmark next-gen game that redefines shooters. TeamXbox gave the X360 version a score of 9.3 out of 10, saying that it has "some of the best modern combat scenarios you’ll have ever taken part in. Ubisoft is not only kicking the door in with Advanced Warfighter, they are taking the whole damn building down along with it!" Reviews for other platforms ranged from positive to mixed to negative. GameRankings and Metacritic gave the game a score of 80.07% and 80 out of 100 for the PC version; 64.57% and 66 out of 100 for the Xbox version; and 50.67% and 44 out of 100 for the PlayStation 2 version. 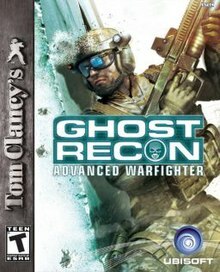 On October 5, 2006, Ghost Recon: Advanced Warfighter won two out of the eight nominated BAVGA awards including, "Best Technical Achievement" and "Best Game". Ghost Recon Advanced Warfighter was a commercial success, selling more than 1.6 million copies by the end of March 2006. Its Xbox 360 release made up 800,000 of these sales, which made it the console's fastest-selling title by that date. The Xbox 360 version sold 360,000 units within a week of release, including 240,000 sales in North America. Europe bought 120,000 copies within three days of release. Sales of Advanced Warfighter's computer and Xbox 360 versions rose by another 560,000 copies between April 1 and June 30, 2006. By the end of September, the game's total sales had surpassed 2.4 million units. Advanced Warfighter sold 1.2 million in the United States, 8,903 in Japan, and 200,000 in the United Kingdom. ^ Adams, David (March 22, 2006). "GDC 06: Ageia Reveals PhysX-Ready Games". IGN. Retrieved August 5, 2014. ^ a b Butts, Steve (May 18, 2006). "Tom Clancy's Ghost Recon: Advanced Warfighter (PC)". IGN. Retrieved August 5, 2014. ^ "New Maps and Features for Advanced Warfighter". Xbox.com. Archived from the original on March 25, 2007. Retrieved April 7, 2007. ^ a b "Tom Clancy's Ghost Recon Advanced Warfighter for Xbox 360". GameRankings. Retrieved May 17, 2010. ^ a b "Tom Clancy's Ghost Recon Advanced Warfighter for PC". GameRankings. Retrieved May 17, 2010. ^ a b "Tom Clancy's Ghost Recon Advanced Warfighter for Xbox". GameRankings. Retrieved May 17, 2010. ^ a b "Tom Clancy's Ghost Recon Advanced Warfighter for PlayStation 2". GameRankings. Retrieved May 17, 2014. ^ a b "Tom Clancy's Ghost Recon Advanced Warfighter for Xbox 360 Reviews". Metacritic. Retrieved May 17, 2010. ^ a b "Tom Clancy's Ghost Recon Advanced Warfighter for PC Reviews". Metacritic. Retrieved May 17, 2010. ^ a b "Tom Clancy's Ghost Recon Advanced Warfighter for Xbox Reviews". Metacritic. Retrieved May 17, 2010. ^ a b "Tom Clancy's Ghost Recon Advanced Warfighter for PlayStation 2 Reviews". Metacritic. Retrieved May 17, 2010. ^ Marriott, Scott Alan. "Tom Clancy's Ghost Recon: Advanced Warfighter (X360) - Review". AllGame. Retrieved August 5, 2014. ^ Edge staff (May 2006). "Ghost Recon: Advanced Warfighter (X360)". Edge (160): 88. ^ Reed, Kristan (March 13, 2006). "Ghost Recon: Advanced Warfighter (X360)". Eurogamer. Retrieved August 5, 2014. ^ "Ghost Recon: Advanced Warfighter (X360)". Game Informer (156): 126. April 2006. ^ "Ghost Recon: Advanced Warfighter (Xbox)". Game Informer (157): 106. May 2006. ^ Four-Eyed Dragon (March 8, 2006). "Tom Clancy's Ghost Recon: Advanced Warfighter Review for Xbox 360 on GamePro.com". GamePro. Archived from the original on April 10, 2006. Retrieved August 5, 2014. ^ Dodson, Joe (March 23, 2006). "Ghost Recon: Advanced Warfighter Review (X360)". Game Revolution. Retrieved August 5, 2014. ^ Colayco, Bob (March 8, 2006). "Tom Clancy's Ghost Recon Advanced Warfighter Review (X360)". GameSpot. Retrieved August 5, 2014. ^ Colayco, Bob (May 5, 2006). "Tom Clancy's Ghost Recon Advanced Warfigher Review (PC)". GameSpot. Retrieved August 5, 2014. ^ Colayco, Bob (March 16, 2006). "Tom Clancy's Ghost Recon Advanced Warfighter Review (Xbox)". GameSpot. Retrieved August 5, 2014. ^ Colayco, Bob (March 31, 2006). "Tom Clancy's Ghost Recon Advanced Warfighter Review (PS2)". GameSpot. Retrieved August 5, 2014. ^ Tuttle, Will (March 10, 2006). "GameSpy: Tom Clancy's Ghost Recon Advanced Warfighter (X360)". GameSpy. Retrieved August 5, 2014. ^ Kuo, Li C. (May 30, 2006). "GameSpy: Tom Clancy's Ghost Recon: Advanced Warfighter (PC)". GameSpy. Retrieved August 5, 2014. ^ Fischer, Russ (March 27, 2006). "GameSpy: Tom Clancy's Ghost Recon Advanced Warfighter (Xbox)". GameSpy. Archived from the original on April 8, 2006. Retrieved August 5, 2014. ^ a b "Ghost Recon Advanced Warfigher Review (X360)". GameTrailers. March 17, 2006. Retrieved August 5, 2014. ^ "Ghost Recon Advanced Warfighter Review (PC)". GameTrailers. May 8, 2006. Retrieved August 5, 2014. ^ Grabowski, Dakota (March 19, 2006). "Tom Clancy's Ghost Recon Advanced Warfighter - 360 - Review". GameZone. Archived from the original on October 6, 2008. Retrieved August 5, 2014. ^ Giacobbi, Kevin "BIFF" (May 18, 2006). "Tom Clancy's Ghost Recon Advanced Warfighter - PC - Review". GameZone. Archived from the original on October 2, 2008. Retrieved August 5, 2014. ^ Perry, Douglass C. (March 7, 2006). "Ghost Recon Advanced Warfighter (X360)". IGN. Retrieved August 5, 2014. ^ Perry, Douglass C. (March 14, 2006). "Ghost Recon Advanced Warfighter Review (Xbox)". IGN. Retrieved August 5, 2014. ^ Roper, Chris (March 31, 2006). "Tom Clancy's Ghost Recon Advanced Warfighter (PS2)". IGN. Retrieved August 5, 2014. ^ "Tom Clancy's Ghost Recon: Advanced Warfighter". Official U.S. PlayStation Magazine: 77. July 2006. ^ McCaffrey, Ryan (April 2006). "Ghost Recon Advanced Warfighter (X360)". Official Xbox Magazine: 79. Archived from the original on February 28, 2008. Retrieved August 5, 2014. ^ "Ghost Recon Advanced Warfighter (Xbox)". Official Xbox Magazine: 76. June 2006. ^ "Ghost Recon: Advanced Warfighter". PC Gamer: 44. September 2006. ^ Fish, Eliot (March 25, 2006). "Ghost Recon: Advance[d] (X360)". The Sydney Morning Herald. Retrieved August 5, 2014. ^ Clayman, David (May 17, 2005). "E3 2005: The Complete MS Conference Guide". IGN. Retrieved August 5, 2014. ^ "Tom Clancy's Ghost Recon Advanced Warfighter Release Information for Xbox 360". GameFAQs. Retrieved August 5, 2014. ^ EGM staff (April 2006). "Tom Clancy's Ghost Recon: Advanced Warfighter (X360)". Electronic Gaming Monthly (202): 90. ^ Soboleski, Brent (March 7, 2006). "Tom Clancy's Ghost Recon Advanced Warfighter Review (Xbox 360)". TeamXbox. Archived from the original on July 20, 2013. Retrieved August 5, 2014. ^ Maitland, Amber (October 6, 2006). "Bafta's top award goes to Ghost Recon: Advanced Warfighter". Pocket-lint. Retrieved August 5, 2014. ^ "Ubisoft Announces Its Results for the 2005-2006 Fiscal Year" (Press release). Paris: Ubisoft. June 28, 2006. Archived from the original on September 21, 2017. ^ "Ubisoft Reports Revenues for the First-Quarter 2006-2007" (Press release). Paris: Ubisoft. July 27, 2006. Archived from the original on September 21, 2017. ^ "Ubisoft Reports Sales for the First Semester 2006-07" (Press release). Paris: Ubisoft. October 24, 2006. Archived from the original on September 21, 2017. ^ Brian Hastings (2007-11-30). "Fantasy of the Familiar". Insomniac Games. Archived from the original (PPT) on 2012-04-15. Retrieved 2008-01-01. ^ "Microsoft Xbox 360 Japanese Ranking". Japan Game Charts. 2008-05-18. Retrieved 2008-05-24. ^ "ELSPA Sales Awards: Gold". Entertainment and Leisure Software Publishers Association. Archived from the original on 2009-03-19. Retrieved 2009-02-03. This page was last edited on 31 December 2018, at 05:40 (UTC).